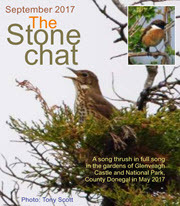 Tony Scott has sent in the latest issue of the The Stonechat , the SOC Ayrshire Branch‘s newsletter. It comes in two parts: Part A and Part B. This entry was posted in News on 27-Aug-2017 .